If you have a business you probably have a website and if you have a website you’ll need content. You can have visually stunning website, with great fonts, colors and design, but the most important part of your website is your content. Without quality content, your website cannot survive. Content is key! When you first started a website you probably gave a great deal of thought to your domain name, and with good reason it’s where your site lives and a huge part of your branding. If your website is your domain, then content is the king of that domain. In other words…content rules! It rules simply because you use content to attract new clients with your blog post, thus leveraging the power of the Internet. Many start-up businesses, and even established businesses trying to expand their business presence online and use the Internet as a prospecting tool, can do so through value based, quality content. You only have one chance to make a first impression. Your website can do that for you through its content. If you understand the value of content and how to use it to reach your ideal market, then you’ll understand the true power of the Internet. For most businesses, creating informative, consistent content seems to be the most difficult step. If you know how to write, you are 95% of the way there. You don’t need to be an English major to understand how to create and use content to expand your business online. But, you do need to know how to write in clear easy to understand language, that is grammatically correct. And…you need to know how to optimize your content. Q.) 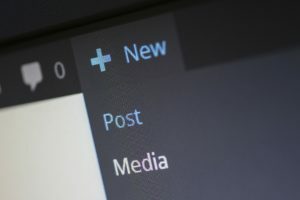 How long should my blog post be? A.) A blog post should be at the very least 300 words in order to be found in the search engines. Ideally though, a post will run between 600 – 1200 words, any shorter and it may be hard to rank as there is not much room to add keywords, or the all-important -tags. Sentence structure is short and to the point. There’s no time for flowery poetic language (depending on your business of course). Most of theHUBline’s blog posts are between 800 – 1200 words, which helps with our organic traffic. Longer content often requires strong writing skills but it gives far more opportunity to mention your keyword(s). You’ll probably have more headings and images which will contain your keyword, along with more keyword related links, both external and internal. The risk however, of longer content is that you’ll need strong writing skills to clearly and accurately develop a thought, longer text can scare off readers and it can take longer to load, especially on mobile devices. Most content should be between 600 – 1200 words, any shorter and it may be overlooked by the search engines any longer and you risk having readers bounce away do to time constraints. Q.) What do you mean by value based content. A.) Value based content simply means that you are sharing helpful information with your ideal client. There is no sales pitch, not product promotion (at least not overtly). While most blog posts will or should contain a call to action and several links to additional articles or even products, there is not an direct sales pitch to the reader. Instead you use content to build a relationship with your audience. Think of it as a networking event. You wouldn’t walk up to people with a sales pitch, you spend time getting to know them, asking questions and probably sharing an exchange of ideas. In the same way, your content through your blog posts is a relationship builder. You use it to share your knowledge, build trust, and create engagement. Q.) How is writing for the Internet different than the writing I may have done in school. A.) Writing for the Internet differs from those English writing classes and essays you had to do in college in that there’s no room for flowery prose here. Keep in mind that most people are searching the web for quick answers. The average person spends only seconds on a page. Internet readers want short concise, bits of information. Articles with bullet points, lists and Q & A’s generally work best. Sentences should be short and to the point. Font should be easy to read, usually a 12 – 14 point font and in basic colors. Make use of white space – it’s far easier to quickly skim content that has adequate space between paragraphs. Give quotes or important details their own line. Bold or italicize important points (but don’t do both) abide by the less is more rule. Q.) How do I write an interesting title? Q.) How can my blog attract my ideal clients? A.) Your blog must be optimized with keywords that target your ideal client. You must understand what your client would be searching for online, in order to know what keywords you may want to incorporate into your article. You’ll also need to determine which keywords you will be able to rank for. You’ll need to include at least 3 headers containing your keywords. All of these steps are necessary if you want your article get found in the search engines and ultimately reach your ideal client. You also must promote your blog post on social media. Posting and promoting consistent, highly optimized content that targets your ideal market will attract more clients. If you provide informative content that speaks to your ideal audience, use keywords targeting that audience and invite comments or even questions, you’ll create engagement, build the kind of trust and credibility that will attract new clients. Want more in depth details? Check out our free training series where you’ll learn more about attracting new clients and expanding your business online. Want support building your business online? Join our free FB group: theHUBlineCommunity, where you’ll get support, strategies and resources to help you grow a thriving business online.